I wanted to become a Director for THON 2019 because I wanted to be a part of the unwavering commitment to changing the lives of our Four Diamonds children and their families. It is both a rare and marvelous phenomenon to witness the successes of tireless human endeavors. The efforts of 16,500 student volunteers working to eradicate childhood cancer will be the difference that encourages the discovery of new, more effective treatments. Countless hours dedicated by each organization will be the difference in providing innovative research in the steps towards finding a cure. Every dancer that stands for 46 hours is the difference between a 10-year survival rate and the long, beautiful life that every child deserves. The awareness spread, the funds raised, the support provided to children and families of Four Diamonds, and the solidarity furnished for those fighting across the world—it will be the difference in the life of a child who is battling cancer. This difference is the reason why I have fallen in love with THON, and why I have wanted nothing more than to be involved year after year. I truly believe that THON will be the difference in the lives of children, not only of Four Diamonds and Penn State community, but around the world, and I want to commit myself unconditionally to the visions of this organization and to the impact that will be made in the lives of children. I want to help create the light that shines out from THON into a world that so often finds itself in the darkness. I want to empower the THON community and I want to work alongside other dedicated, passionate volunteers as we take steps towards the day that we will discover a cure for childhood cancer. What are your main duties as the Alumni Engagement Director for THON 2019? The Alumni Engagement Committee educates the Penn State alumni community about fundraising opportunities and awareness campaigns, empowering them to further THON's mission to conquer childhood cancer. Our goal is to foster and maintain relationships with THON's new, longstanding and future alumni as they support students, the University and the THON community. 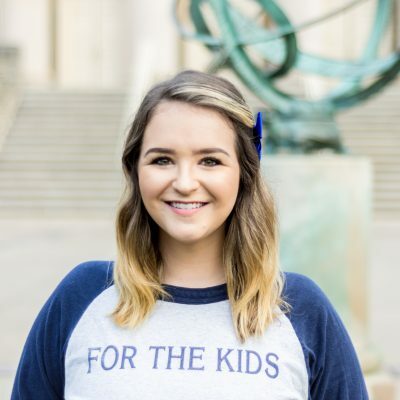 As the Alumni Engagement Director, I am responsible for working extensively with members of the Penn State alumni community and creating new ways to involve alumni in THON's yearlong fundraising and awareness efforts. My position, along with the 16 Alumni Engagement Captains, is responsible for spearheading many of THON's fundraising initiatives and creating the various solicitations and awareness pieces provided to our Penn State Alumni community. Further, I work to oversee and improve THON's solicitation techniques in hopes of expanding our donor base into new demographics. This is primarily accomplished through outreach campaigns, a series of mailers, an increasing online presence, and various channels within the Penn State community. In my position, I also work closely with the Penn State Alumni Association, Dance Marathon Alumni Interest Group (DMAIG), Penn State's Office of Development, and various alumni groups across the country. What is your favorite THON memory? With the influx of spectators on Saturday evening of THON 2017 our tour schedule ran behind, so I quickly offered to take additional tours to help alleviate the issue. Amidst the bustling energy of Pep Rally that evening, I had no idea I was about to meet a family who embodied the living meaning of the diamonds we so proudly display. They were a Four Diamonds family who lost their child years ago, and this was their first time returning to THON. I will never forget taking them onto the floor, and the moment their bodies froze, their eyes gazing upon the thousands of people who filled the BJC. They had experienced the unthinkable pain of losing a child, and yet they were completely captivated by what they saw, by the energy and the colors that existed so vehemently before them. They told me that it was like their little girl was alive in here, “In each of the volunteers and dancers - in you.” To witness a family so enthralled by what thousands of students had created for them was truly indescribable. At the end of the tour, they turned to me and said, “We are all a part of this, and you have become a part of us now,” as the mother removed a bracelet from her wrist and clasped it around my own. Each day, this bracelet serves as a painstaking reminder of the brave children we lost, and the thousands of families fighting today. Yet at the same time, I believe it is a symbol for the love and hope that THON fosters, an emotion beyond expression; words fail, yet something arises and takes over instead. It is a human connection unlike any other, a connection between all of us, bounded by something so crippling, so painful. It is the reason why we will never stop dancing. Are you involved in any orgs? Lion Ambassadors - I joined Lion Ambassadors during my sophomore year. "THON is the love we never thought we could feel, the feeling we never thought we could dream, and the dream we never thought could come true."